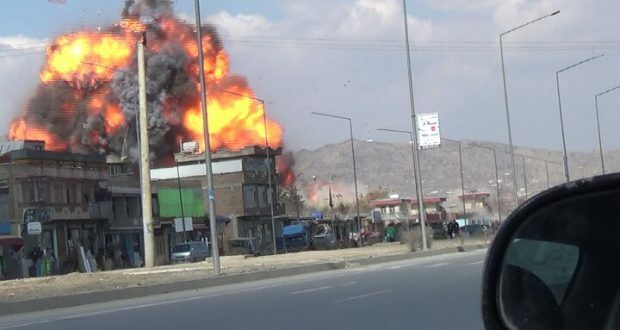 The complex coordinated martyrdom attacks , part of the annual Omari Operations, began at around 12:30 pm local time on 3 sites inside Kabul city and lasted till around dusk time. The attack was carried out by 7 martyrdom seekers of Islamic Emirate namely Mullah Habibullah Ghaznawi, Student Alim Wardak, Mullah Muhammad Anwar Farahi, Subhanallah Laghmani, Mullah Abdul Raheem Paktiawal, Mullah Muhammad A’zam and Abdul Haq from Logar, with each armed with heavy and light weapons, explosives vests as well as grenades, and car packed with explosives. The first target was PD6 Department, second the adjacent Recruitment Center and the third a key intelligence center used for torture located in Arzan Qeemat area of PD12. Initially Mullah Habibullah Ghaznawi detonated his explosives laden truck at a point between PD6 Department and Recruitment Center such that it heavily damaged both buildings and cleared all barriers for the other martyrdom seekers to enter inside. Following the explosion, 2 martyrdom seekers entered PD6 Department and 2 others Recruitment Center where they began shooting the hireling who were not killed in the initial powerful explosion. As the attack was ongoing, the remaining 2 martyrdom seekers where Mullah Muhammad A’zam opened fire and killed the 3 guards, then he entered the building and set off his explosives which opened the way for the second martyrdom seeker, Hafiz Abdul Haq, to enter. The fighting against enemy forces at all 3 sites lasted for about 6 hours. At all the attack sites, some 77 key enemy officers, police, army and intelligence personnel were killed and around 99 others wounded. 14 were reported killed by explosions and clearing ops in the intelligence center and up to 60 in the Recruitment Center and PD6 Department while 28 more were injured in the intelligence center and 71 at the remaining two sites. All the Mujahideen participants were also martyred after 5 hours of heavy combat, may Allah accept them. The enemy claims of preventing the martyrdom seekers from entering the intelligence building are completely false. If we observe the pictures provided of the operations, this claim will be rubbished because the explosion takes place at the location pinpointed inside the building, causing heavy losses. 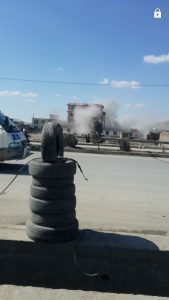 Meanwhile as these attacks were underway in the capital of the country, Kabul, Mujahideen of Islamic Emirate managed to take completely control of Tala wa Barfak district in northern Baghlan province, killing and wounding several police and detaining 13 as well as seizing a large amount of arms, ammunition and equipment. 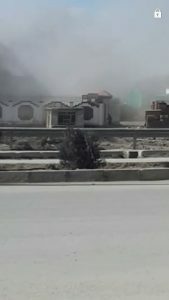 Mujahideen also overran 4 check posts in Laghman capital Mehtarlam, destroying 7 APCs and seizing 5 along with arms and equipment, killing and wounding several gunmen and detaining 7.